Is your forklift truck up to the mark? 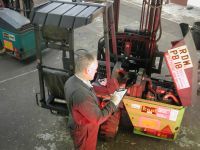 If you operate a forklift truck (Moffett Mounty), you have a legal obligation to ensure that it holds a valid Report of Thorough Examination. This applies whether you own, lease or hire the truck. Failing to comply could be disasterous: prosecution, invalidation of your insurance or, worst of all, a serious accident due to faulty equipment. They are many companies who offer to carry out Thorough Examinations - so who should you choose? Why use the fork lift truck industry accredited scheme? 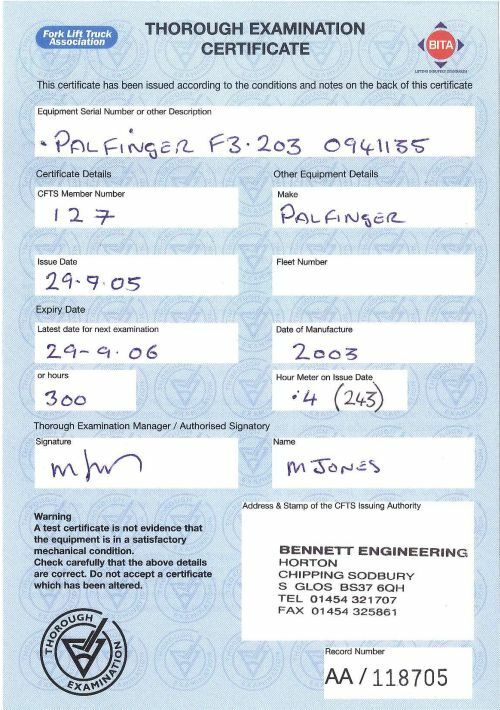 We carry out Thorough Examinations on all leading brands of Truck Mounted Forklifts including Palfinger, Moffett Mounty, Moffett-Kooi and Moffett. To understand the significance of a scheme that's truly nationwide, it's worth comparing the testing of a fork truck to the MOT for cars. Imagine what it would be like if there were no cohesive national system for assessing the safe condition of cars. Imagine if garages were allowed to decide for themselves how to carry out MOT tests. Imagine if an MOT certificate issued by one garage was based criteria and practices which differed widely from those used by another. Imagine if there was no one to oversee the process nationally and ensure consistent high standards. The new scheme - described as the biggest safety advance in many years - has been developed co-operatively by the two leading bodies in the fork lift truck industry: British Industrial Truck Association (BITA) and the Fork Lift Truck Association (FLTA) under the banner of Consolidated Fork Truck Services (CFTS). Companies approved under this scheme have the required skills and knowledge to carry out a Thorough Examination giving you the peace of mind that you fork lilft is safe to use.